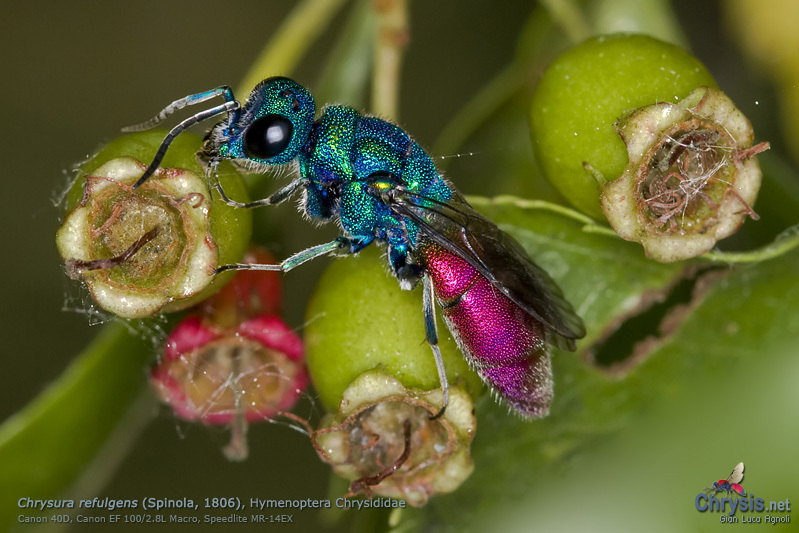 Welcome to Chrysis.net, your web resource on Hymenoptera Chrysididae and Macrophotography. Chrysidids – other common names are Cuckoo-wasps or Ruby-tailed wasps – are colorful solitary wasps, parasitoids or cleptoparasites of other insects - generally other solitary wasps and bees. Chrysis.net website offers a lot of textual and photographic resources on Chrysidids and deals also with Photography, with a particular attention to equipment and macrophotography. 05/2012 - The checklist of the Italian species according to their distribution in the administrative regions is available. 05/2012 - Updated the page on the Chrysidid morphology. 01/2012 - Updated the Photo Handbook (in Italian only). 12/2011 - The Introduction to Chrysidids is available in Russian language too, thanks to V.V. Fedorenko. 11/2011 - The key to the Italian Genera of Chrysidids is online (in Italian only). Here you find the key for the identification of the Italian genera of Chrysidids, that allows you to identify the Subfamilies, Tribes and Genera of the Italian Chrysidids. Chrysis.net website has been restyled for the third time from its birth: new layout, new logo and new style, more modern, easy to use and with many benefits for both visitors and search engines. And many new features are coming! Subscribe to Chrysis.net Newsletter to receive the latest news (archive).